Performance: Wen Yau, ______ can’t be black | P! 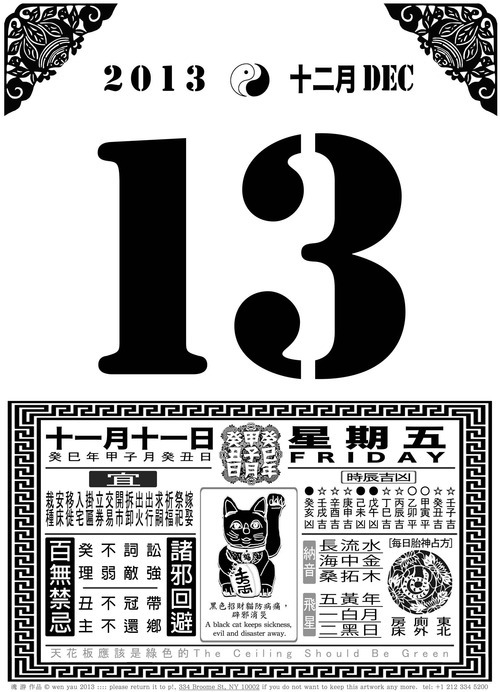 On Black Friday, December 13, 2013, Hong Kong-based artist Wen Yau explores superstitions and their inversion in multiple locations in Chinatown. This performance is part of the exhibition, The Ceiling Should Be Green, on view at P! through December 22, 2013. Wen Yau is a cross-media artist, researcher, curator, and writer, whose work grapples with cultural difference and intimacy as enacted in public space. She has presented projects recently in Hong Kong, Macau, Mainland China, Taiwan, Japan, Korea, the Philippines, the USA, Sweden, Italy, New Zealand, and Bolivia.